Patients with type 2 tibial hemimelia have a proximal and distal tibial epiphysis articulating at the knee and ankle. The knee is mobile but often unstable due to absence of cruciate ligaments and depression or deficiency of part of the tibial plateau. The ankle plafond is present but often dysplastic, and thus does not have much motion despite its presence. The presence of a plafond differentiates it from Paley type 3 tibial hemimelia, which is more deficient due to the lack of a tibial plafond. Ankle diastasis is not typical, but some degree may be present depending on the severity of dysplastic changes of the tibial plafond. The foot is usually in equino-varus. If the equino-varus deformity exceeds the malorientation of the tibial plafond, which is due to bony deformity, the ankle should be distracted with an external fixator to correct the contracture followed by staged osteotomy to realign the tibia with the foot together. If the equino-varus does not exceed the tibial deformity, an osteotomy of the tibia for angular correction of the tibia with the foot, combined with lengthening, is carried out relative to the longer fibula. The circular external fixator extends from the femur to the tibia and foot. The bracket epiphysis can be oriented in any direction and does not always correspond to the deformity seen. The fibula is much longer than the tibia. The treatment in these cases is to consider the direction of the bracket in planning the surgery. To interrupt the bracket, the cartilage of the epiphysis and physis is cut, and an osteotomy is performed through the bone at the same level. 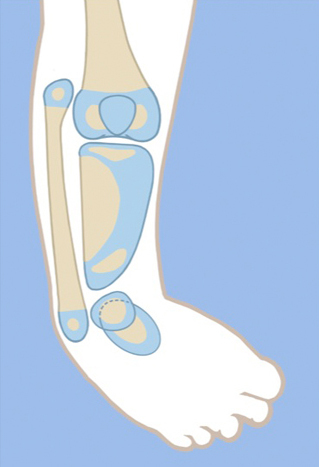 To allow for acute correction of the deformity, part of the fibula must be resected. The acute correction is accomplished by an opening wedge osteotomy on the side of the bracket, with or without a partial closing wedge on the opposite side. The correction can be done with or without lengthening at the same time. With lengthening, it is done with the external fixator extending to the femur. Without lengthening, fixation is obtained with axial retrograde wires entering through the foot and if necessary also crossing the knee. The ankle joint, while present in these cases, is not functional. The goal is to create a plantigrade foot with a stable ankle. This usually requires distraction of the foot through the ankle joint, followed by a secondary arthrotomy as described for type 2 deficiencies to best match the articulation between the talus and tibia. The syndesmosis may or may not need to be fixed with a syndesmotic suture washer device. 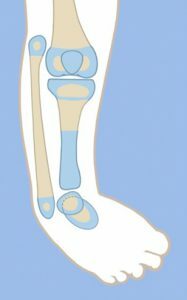 The unossified portion of the tibia will eventually ossify after many years. To accelerate this process, bone morphogenic protein (BMP2) can be inserted into the cartilage. This is an off-label use of INFUSE (Medtronic, Memphis, TN). The basis of its use in tibial hemimelia is Dr. Paley's experience using BMP2 in delayed ossification of the femoral neck to promote ossification in congenital femoral deficiency. Ossification of the tibia facilitates lengthening and deformity correction of the tibia through bone. 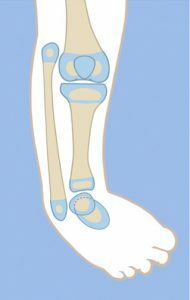 If sufficient parts of the tibia are bony, an osteotomy can be made through the bony portion and pins placed in the bony portion. If an insufficient portion of the tibia is ossified to allow for external fixation, then open surgery is performed to acutely realign the foot with a tibial osteotomy, combined with resection of part of the fibular diaphysis. To ossify the tibial anlage (non-ossified portion of the tibia), BMP2 is inserted into drill holes in the cartilage. Stabilization of the osteotomy is achieved with retrograde axial Kirschner wires through the foot and up the tibia. In most cases, ossification of the anlage is already seen by 3 months after BMP2 implantation surgery. Lengthening is usually done 1 year later, after ossification of the unossified segment of tibia.